Stock your storecupboard with these versatile ingredients to get your year going on a healthy note, advises health expert Natalie Savona. Why is it good for me? Yellow fields of rapeseed have traditionally been grown for animal feed. However, some growers are now producing cold-pressed oils for us to enjoy. Once unpalatable, it has now been bred to eradicate any bitterness. Rapeseed oil is over 60 per cent monounsaturated fat, the type that olive oil is famous for – with all the associated benefits of the ‘Mediterranean diet’, which is so good for the heart. Yet it contains only half the saturated fat of olive oil. A tablespoon of this golden goodness will also give you over half your daily need of antioxidant vitamin E.
Add to your diet: Use as an alternative to olive oil in cooking, for roasting and for frying. The monounsaturated content also means rapeseed oil retains its benefits even when heated to frying point. a substantial amount of fibre, providing 3.8g per 100g of cooked grain. Like oats, barley contains the soluble fibre, beta-glucan, useful for lowering cholesterol and delivering a slow release of energy. A 100g portion of cooked barley will also provide about an eighth of your daily dose of vitamin B3 (niacin), essential for energy and a healthy nervous system. Add to your diet: In addition to traditional soups or hotpots, use as an alternative to risotto. ‘No need to soak’ mixes can be added straight to your cooking and are ready in 10 minutes. You can use pearl barley instead of rice or wild rice in salads. Why are they good for me? Soya has shed its worthy health food reputation from its incarnation as tofu or soya milk, with the beans – also known as edamame beans – now easy to buy. They are a great source of protein and essential amino acids, so are particularly good for vegetarians and vegans. They’re also great value, with bags of frozen beans available at most supermarkets (they cost around Dhs11). Some studies suggest that menopausal women should eat soya to help balance their hormones. But for this reason, there are concerns that children should not eat soya in large amounts. Ideally, buy organic to avoid genetically modified soya. Add to your diet: Use soya beans instead of broad beans or peas in recipes, or add to soups, stews and risotto. They also make a great side veg tossed with mint. Why is it good for me? A real protein-powerhouse (providing twice as much as brown rice), this versatile grain is a great choice for everyday meals as it is quick and simple to cook. A relative of leafy green veg like spinach and Swiss chard, quinoa is suitable for vegetarians or vegans, and is also gluten-free. Quinoa (pronounced ‘keenwa’) is high in fibre, with one portion giving you the equivalent of a portion of prunes. This native South American ingredient also packs a real punch when satisfying healthy appetites as it has a good satiety factor – meaning it keeps you feeling fuller for longer. Add to your diet: With its mild, nutty flavour, quinoa can be used in place of couscous or rice – it takes just 10 minutes to cook. For a substantial salad, add chopped herbs, leaves and a favourite dressing. Why are they good for me? Oily fish are hailed for their unrivalled omega-3 fat content – good for the heart, blood vessels, blood pressure, brain, joints and more. Tinned sardines are convenient and great value, too, and because the bones are edible, there is plenty of calcium in them. A 100g serving will give you 380mg of calcium, over half an adult’s daily needs. They also provide vitamin D – 100g of canned sardines gives you at least the recommended daily dose of 200IU. Vitamin D deficiencies are increasingly linked to cancer, cardiovascular problems, auto-immune diseases such as multiple sclerosis, and weak bones. Add to your diet: Try sardines on toast, or chop them roughly and add to pasta. Sardines are easily available at most supermarkets. Why is it good for me? Honey, a natural form of sugar, adds extra flavour to your cooking. It has been used for centuries as a wound healer for its antibacterial and antiseptic properties – the traditional honey and lemon hot drink is still a good way to soothe a sore throat.Honey is 97 per cent sugar, though, so use judiciously as it can contribute to tooth decay and weight gain. To get the best from its healthy properties, use honey gathered by bee keepers who do not heat, process or blend it. 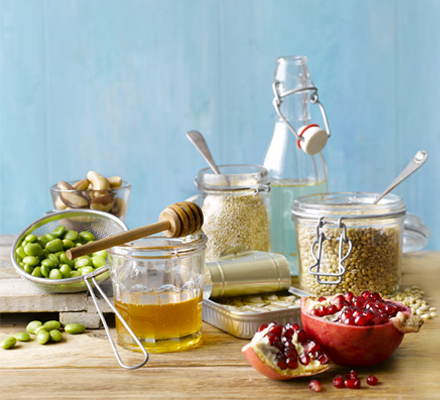 Manuka honey from New Zealand has very powerful properties – but is far too expensive to cook with! Add to your diet: Honey adds a rich sweetness to savoury dishes as well as desserts and it is often used in Middle Eastern and Asian cooking. Why are they good for me? Full-of-flavour Brazil nuts are highly nutritious. They are a source of an essential mineral – selenium, which, among other things, is needed for an enzyme called glutathione peroxidase, one of the body’s own built-in antioxidants. It also helps the immune system and thyroid to work more effectively – and just one Brazil nut provides your daily requirements. They are also high in healthy fatty acids – about a third polyunsaturated (mainly omega-6), and another third monounsaturated. Add to your diet: Enjoy Brazils as a snack, in salads, or chopped up in crumble toppings. They make a great substitute for pine nuts in pesto – blitz with herbs, garlic, olive oil, Parmesan and lemon juice and toss through pasta – and you can also use them instead of almonds in bakes. Why are they good for me? With a very high antioxidant content that includes polyphenols, tannins and anthocyanins – which are higher than green tea or red wine – pomegranates have powerful abilities. The fruit appears to protect against high blood pressure, plaque deposits, hardening in the arteries and some cancers, such as prostate. Pomegranate seeds are rich in fibre and low in calories – it has 83 calories and 4g of dietary fibre per 100g serving – and helps keep you ful for longer, which also makes it a great food to aid weight loss. Add to your diet: Try sprinkling pomegranate seeds on your yogurt or muesli for a healthy breakfast. You can also use it in salads, in couscous, as a dessert topping or garnish in Middle Eastern dishes. Next PostNext &RightArrow; Eat smart!